I called the instructor of my counseling course. Tension rose. I knew what I needed to do. Stalling was no longer an option if I was to walk in integrity as a counselor and a child of God. My brother-in-law molested me as a child. Now his granddaughter, my great niece, was the age when sleepovers with her grandparents, were imminent. I could keep the secret. This was between my brother-in-law and me. Yet how can a woman of faith surrender to fear and allow an innocent child to become a victim? I spilled my story to my instructor. The first two questions I could answer without emotion. When she addressed my fear, I unraveled. She understood and prayed for God’s courage. I felt foolish. 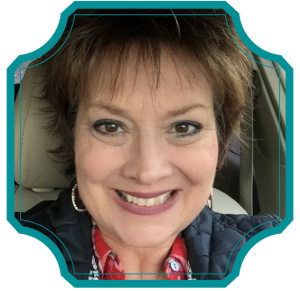 I was an adult in my late forties, a counselor. Yet I was a little girl again, cowering in fear, watching my father’s irrational rages. Thankfully, they didn’t occur often. My former brother-in-law lived miles away. I’d had no contact with him for over thirty years, not since my sister’s death. I was aware he contacted my father after my mother died. Petrified and convinced my father wouldn’t believe me, I feared his accusal of my stirring up trouble in the family. He preferred secrets over truth if they allowed for a semblance of peace. Anything causing waves made my father feel helpless. My worst fear other than encountering the torrent of his anger was, “What if he didn’t care?” What if he cared more about protecting and keeping the peace with my brother-in-law than protecting me and his grandchildren? It happened many times before. I made excuses for his avoidance of anything controversial; anything requiring him to take a stand. My father had many admirable qualities. Courage was not one. I thought of ways I could warn my nephew without stepping on toes, without my toes being crushed. This situation revealed I would only repeat my father’s example. I had worked years to overcome codependent behavior. There it was. Its ugly head, rising beckoning me. The Lord and I had walked through many landmines together and countless times He had instilled His courage in me. Faith always involved a risk; why this one? 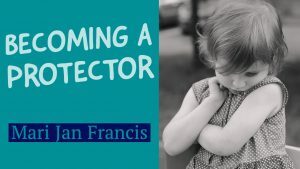 Until I met my husband, I never had a protector in my life. This was a contributing factor of how my abuse even occurred. Now challenged to protect, I desperately wanted to retreat from my father’s raging and the rejection that would follow; and the shame. My father was in his eighties, age did not matter. He was still my father. I knew when I told my nephew about his father’s sin, my nephew would confront my brother-in-law who would contact my father and accuse me of lying. I witnessed this when my sister was alive. My parents chose his words over their own daughter’s truth. My husband knew the story. I wept and deliberated about the task before me. I would tell my nephew. Still, I trembled at the thought of the lies, accusations and anger guarding them. I will never forget what occurred next. My husband took my face in his hands. “Your father will have to go through me first, to get to you. Anyone who tries to blame you, intimidate or lash out in anger against you; will deal with me. They will have to go through me to get to you.” Those precious words, I knew my husband would do what he said. He is not a coward. Soothed by my husband’s promise, my fear lessened. I was not alone. It was time to call my father. The image of my husband standing firmly in front of me gave me courage. Concerns were still there. What if they didn’t believe me? I called my nephew’s wife. My story provided confirmation of what she had suspected. God’s faithfulness to uphold my reputation had always been there, waiting for me; even when fear overshadowed my faith. Now, eyes fixed on Him, and with renewed faith, I called my father and told him the secret. I recall little about my conversation with him. It didn’t matter anymore what he said or didn’t say. Years later… my niece is a remarkable young woman, untouched by the sin of her grandfather..I am amazed how fear begets fear and how courage gives birth to courage. Fear transformed into faith in a heartbeat. This faith took me beyond the fear to courage and action. My husband is a beautiful picture of Christ. There are many examples in scripture of Jesus standing. In Acts 7:55-56, Jesus stands in an open heaven at the stoning of Stephen. He stands in judgment and authority, over sin. 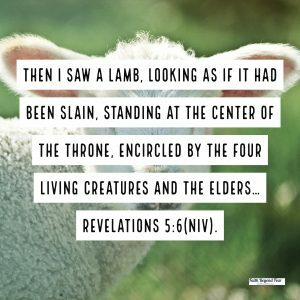 In Revelations 5:6 “Then I saw a Lamb, looking as if it had been slain, standing at the center of the throne, encircled by the four living creatures and the elders…” (NIV). The Lamb who was abused, slain, believed to have been hushed by man, now stood in power, in strength, the Overcomer. The transformation in me of a coward to a protector, of a secret keeper to truth teller, occurred because Jesus reminded me, through the loving example of my husband; The Lamb was standing before me. All sin and sinners must go through Him. Only the Lamb that was slain can judge and deal with sin and demolish fear. Is there a place where fear has swallowed you or kept you silent? Do you see Him standing for you? He is. He is standing. Have faith beloved and move beyond fear. Thank you so much for sharing your story with us! What an inspiration! So blessed to share. Thank you for your encouraging comment, Emily. This story is so beautiful. Look how God transformed tragedy into triumph. He didn’t erase your youth but used it to save someone in the future. Thank you, Brittany. God truly does transform and redeem! This was such a powerful story. Thank you for sharing your experience and for sharing your courage. “I am amazed how fear begets fear and how courage gives birth to courage. -Mari-Jan Francis” Love this quote. Thank you, Stephanie! All glory goes to Him! Your response deeply encourages me. Thank you for taking the time to read and respond. Thank you for sharing this. There is someone out there who will read this and be able to share their experience. Praying that will occur. Thank you for reading and responding. What a beautiful testimony of God’s love and faithfulness. I went through a similar situation and was most afraid of my father’s response. I appreciate your transparency and vulnerability. Our God is so faithful to make beauty from the ashes. I’m always amazed at the redemptive love of God. Thank you, Dawn, for sharing your heart. May you continue to experience the great love of our Heavenly Father. Thank you for sharing about Jesus standing with me. His presence truly does bring “shalom” to our heart. We worry about our reputations. God worries about our character. So glad your husband stood his ground next to you. He is what husbands are supposed to be. So sad that you went through the torment of abuse and then the torment of telling later on. God bless! You are absolutely right! Thanks for this reminder. I cannot imagine how being in your situation must feel like. I can read your blog post but it’s difficult to understand the pressure that comes from those kinds of experiences, I imagine. I’m glad you have a strong husband, Mary Jan.
My husband is truly a gift. God has used him to show me His unfailing love and protection. Thank you Edna for your heartfelt response. Powerful story so thanks for sharing. Fear and intimidation can have such a hold on us that it blocks us from what God is telling us to do. I am so sorry you experienced such a horrible thing and pray for you and all those suffering from abuse. Totally agree with you, Yvonne. Fear is a powerful weapon the enemy uses to intimidate and keep us from the healing God so willingly has in store. So thankful for God’s grace to equip us to follow Him in all things. Wow, this is powerful. Thank you for writing it and sharing it with us! Thank you for reading and for your word of encouragement.